Contact us if you need any assistance. Our email is sales@featherflagnation.com. Toll free number: 877-900-5692. For design requests, you can use the button at the top of the page. 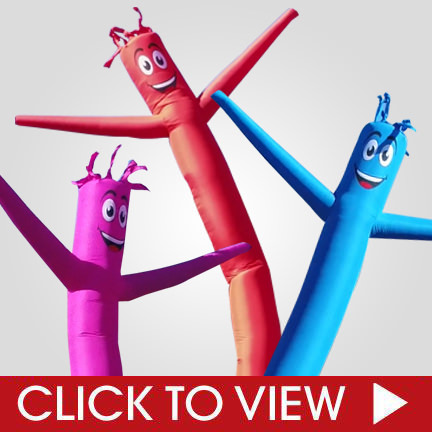 Purchase your high quality inflatable tube man at near wholesale prices. Buy now and save with our introductory price. 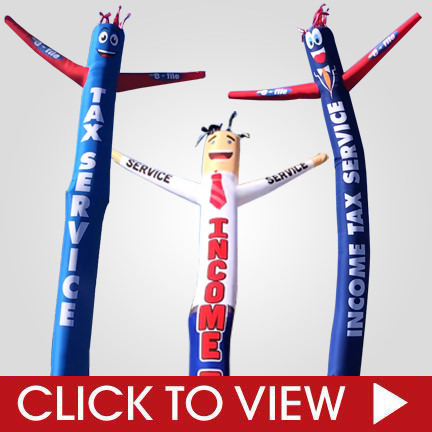 Make your business stand out with ease with our professionally designed inflatable tube mans. Our dancers are not only made for people to look your way, but they are also designed to create conversions. An inflatable tube man should do more than just create noise. If you are not converting your impressions to sales, then you are not getting a return on your investment. Our custom tube dancers have proven to increase sales by clients who have used them 4 to 6 hours a day — at their store front which is visible to traffic passing by. 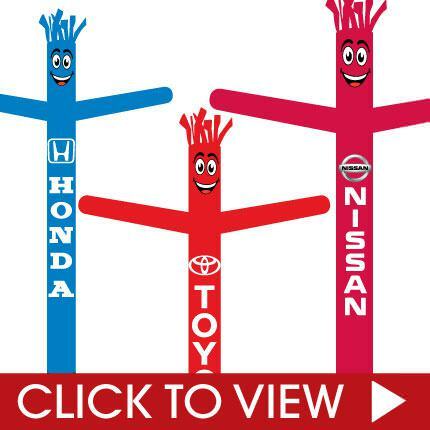 Browse our inflatable tube man categories below to see if a stock fly guy design will work for you. 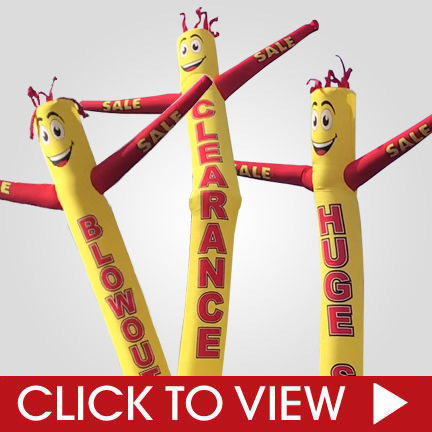 We have plenty of stock inflatable tube man designs for you to explore. 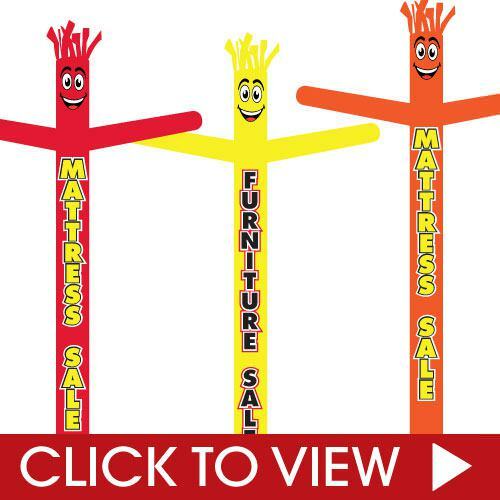 Click on each category to find out if a stock inflatable tube man will work for you. See which inflatable tube man you want to call your own. 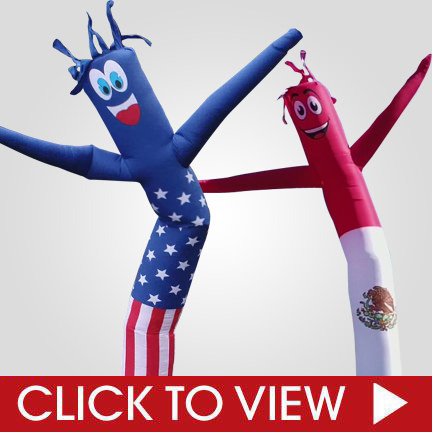 We have stock sky dancer designs that include solid colors, national or state flags, well-known franchises, companies like mattress stores that often use advertising inflatable tube mans, and even fun miscellaneous designs. 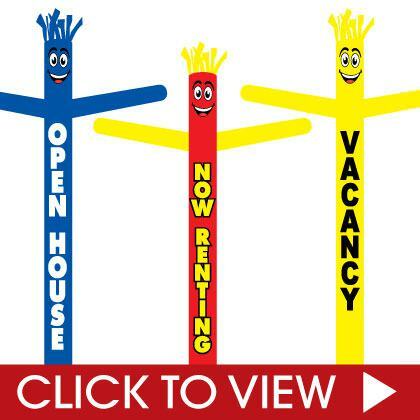 Find the inflatable tube man that stands out to you, or quickly order a custom inflatable tube man that includes your your brand, organization name, logo, theme colors, and so much more. Additionally, our stock and custom air inflatable dancers use high quality inks to create bright designs that bring your tube man to life. Our custom sky dancers are made in-house, therefore we ship within 2 to 3 business days. Rush services available (rush fees do apply), we can ship same day or next day – please check with us. 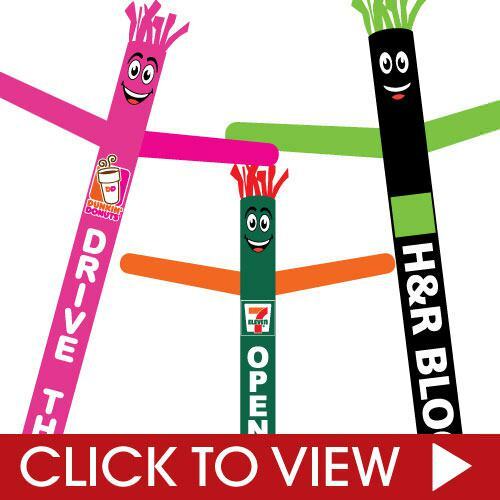 Our tube man bodies are 18ft tall on their own. With the air blower, they will stand about 20ft tall. Our inflatable tube man bodies should work on blowers with 18” diameters. To guarantee a good fit, we advise you purchase the body and blower from us. We will be adding new sizes and designs in the near future, so check back often! Got a request for a stock design? Send us a message and we’ll see if we can get it in. Our tube dancer categories above will also be adjusted as more designs become available. Why buy your tube man from us? Our inflatable tube man is made of a heavy duty polyknit material. It is a unique fabric designed specifically for inflatable tube mans. We do not use cheap nylon that quickly rips if someone grabs it. They can withstand outdoor conditions and are able to move freely and flexibly for a long time so you can optimize your advertisement to get the most public attention as possible. No one can resist the fun energy that an inflatable tube man brings to the environment! Is your inflatable tube man embroidered? Absolutely not. Embroidering is the worst type of method for creating sky dancers. We print directly to the material, preventing text and graphics from flying off over time. Can you customize a stock inflatable tube man? Yes, we can customize any of our stock fly guys. Extra fees do apply. Can I buy matching custom flags? Of course. We offer a variety of standard custom flags, custom feather flags, teardrop flags, rectangle flags, flag banners, and vinyl banners. See which one works best for you. Can I use live images? Yes, our print process allows for full color custom inflatable tube mans. Is there a text limit? There are no limitations on text, graphics, colors, or anything else. Design the tube man as you like. We can ship a select number of units same day, if placed before 10AM PST. Rush fees do apply. Can I purchase a 6ft tube dancer? At the moment, we only offer an 18ft size. We will be adding a 6ft and 10ft sky dancer size in the near future. Will your tube man work on my 18” air blower? It should work, if it has a velcro attachment. But, we do not provide any guarantees. We advise to buy it from us. What is the difference between your tube men and your competitors? 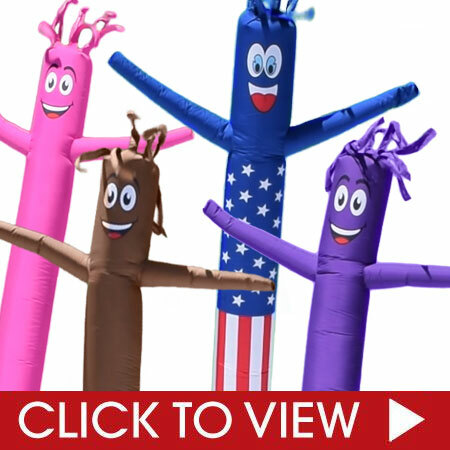 This advertising puppet is also sometimes called a sky dancer, inflatable air dancer, inflatable tube man, dancing tube, fly guy, and a variety of other names. These are all the same type of products – puppets that wave with a blower attached under it. Only difference are the materials and looks of the inflatable from one vendor to another. Unlike most vendors who use nylon to create custom inflatable tube men, we use a polyester material that we created from the ground up. This material lasts much longer than nylon, allows for full color prints, and doesn’t pop or fray away easily. If you want a long lasting air powered dancer man, then you’ve come to the right spot. What makes polyester better than nylon? Polyester material has been tested and proven to be more durable for outdoor use. This is the reason almost all companies will use polyester for their custom flag prints. Not only does nylon material fade and deteriorate quicker outdoors, but when air is blowing throw it, it tends to pop easily. 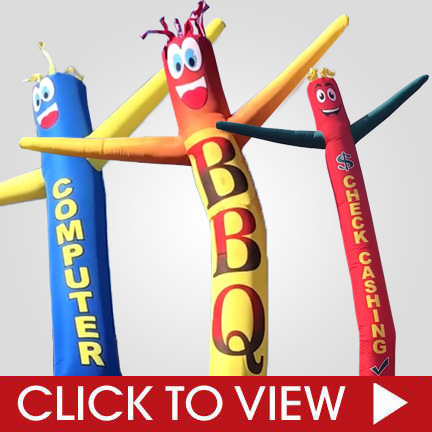 Do you offer wholesale prices for inflatable dancers? Yes, you can submit a broker quote from the link at the top of this page. 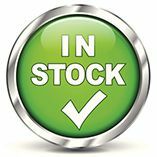 Once approved, we will email you wholesale pricing. Are their bulk quantity discounts? Yes, if you are purchasing 10 or more sky dancers, send us an email for a quote. Will my tube dancer color match my custom feather flag prints? Due to a different machine being used for custom feather flags and inflatable tube mans, your colors will vary.